Susanne Preble has been sharing her equestrian insight and travel experiences with readers since 2003. She has been teaching, training, and managing professional facilities for more than 20 years. Preble holds an Associate of Arts in accounting and will soon obtain her Bachelor of Science in business administration. She graduated from the University of Phoenix in 2008. There is no shortage of detoxification methods circulating throughout the natural health industry. Some of these methods are restrictive and dangerous to your health. Exclusively drinking a detox tea does not promote good health. Dawn Jackson Blatner, a registered dietitian, states in a Medill website article, “Demysitifying Detox Diets,” variety and balance in your diet is necessary to avoid dangerous health problems. Your liver plays an integral role in detoxifying your body of harmful elements. A poor functioning liver will not be able to keep up with the constant onslaught of environmental pollutants that need to be expelled from your body, states Dr. Mehmet Oz, MD. He adds that detoxification is necessary to keep your liver functioning properly so that it does not become clogged. The results of an overburdened liver can be cirrhosis, brain dysfunction, hormonal imbalances and an increased risk of cancer says Dr. Oz. According to Jackson Blatner, the best detoxification plans follow a pattern of eating fruits,vegetables and whole grains that are fresh, raw and organic, while eliminating sugar, caffeine, fats, refined carbohydrates and other toxic substances. She also recommends adding high fiber foods and drinking adequate liquid to help your body naturally detoxify itself. Adding a detox tea to an already healthy diet may benefit your body simply by increasing fluid intake. One of the more conservative methods of detoxifying your body is to supplement your well balanced diet with a tea that is high in antioxidants and specifically formulated to improve liver function, as well as support the other digestive organs that play a role in detoxification. There are two popular theories of natural health that promote detox tea: the Traditional Chinese Medicine, TCM, and the Indian Ayervedic system of Medicine. Both alternative theories recommend the use of herbal supplements to promote the healthy function of your organs. You should consult your primary care providor before taking any herbs. According to Dr. Michael Lam, MD, MPH, ABAAM, a specialist in nutrition and Anti-Aging, detox teas typically consist of a combination of herbs that promote good digestion by cleansing the body and encouraging the elimination of waste. Dr. Lam recommends you start slowly by steeping the tea for only two minutes as you may experience mild cramping or diarrhea initially. You may increase the steeping time to five minutes once your digestive system has adjusted, states Dr. Lam. He also recommends you increase your water intake while drinking a detox tea in order to prevent dehydration. You should consult your primary care provider before drinking detox tea. Green tea is one source of antioxidants. According to Dr. Lam, antioxidants can fix cellular damage caused by free radicals, or environmental toxins, and reduce your risk of suffering a blood clot. 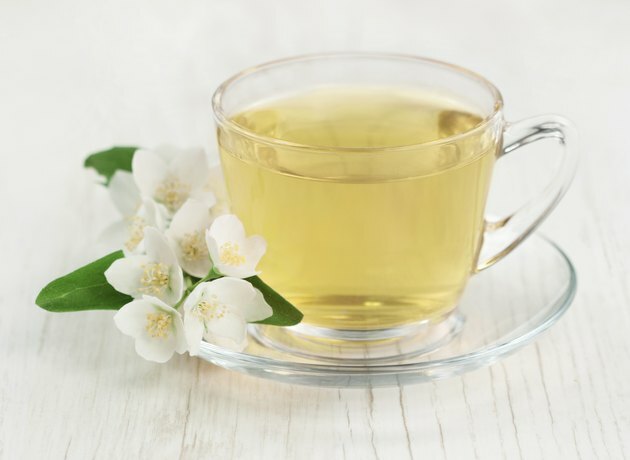 The amount of antioxidants present in 1 cup of green tea that has been steeped for five minutes is relative to the amount found in one serving of vegetables. Ask Dr. Oz: What Happens if the Liver Can't Clear Away All of Your Blood's Toxins?